What an interesting challenge this was I know nothing about Peruvian food so this was an eye opener for me. 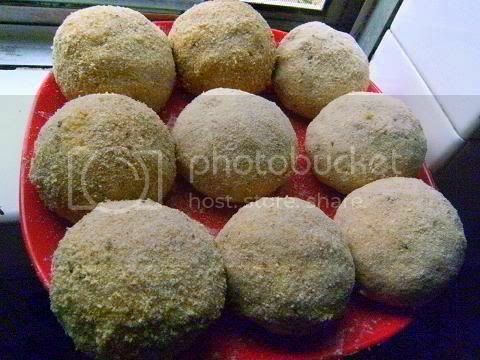 Papas are mashed potatoes balls with a veggie or meat filling which are crumbed (breaded) and then deep fried. 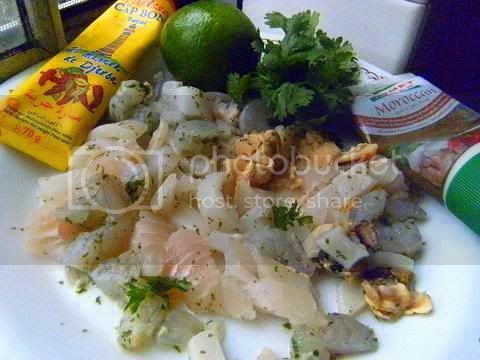 While ceviche is raw fish that is 'cooked' in lime juice. I love raw fish so this was going to be fun. 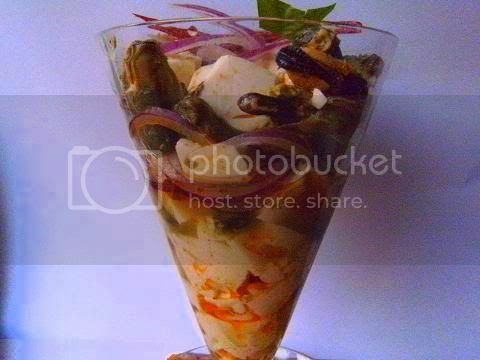 Recipe Source: Ceviche de Pescado from “Peruvian Cooking – Basic Recipes” by Annik Franco Barreau. Papas Rellenas adapted from a home recipe by my Spanish teacher Mayra. Vegan Papas Rellenas recipe adapted from the Vegan Good Eats blog (http://vegangoodeats.com/2010/05/papa-rellena/), wrihttp://www.blogger.com/img/blank.giftten by Joel Luks. The Salsa Criolla recipe also comes from Joel’s blog. Blog-checking lines: Kathlyn of Bake Like a Ninja was our Daring Cooks’ March 2011 hostess. Kathlyn challenges us to make two classic Peruvian dishes: Ceviche de Pescado from “Peruvian Cooking – Basic Recipes” by Annik Franco Barreau. 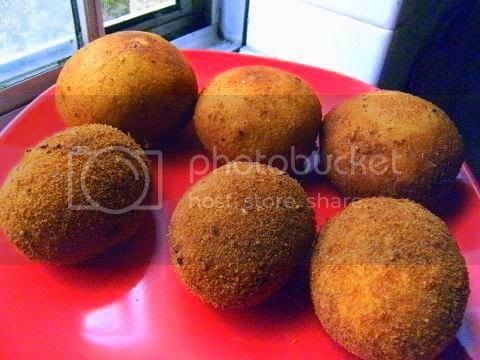 And Papas Rellenas adapted from a home recipe by Kathlyn’s Spanish teacher, Mayra. Wow what a surprising recipe, I have never heard of papas before, also I thought this challenge was going to be very 'interesting' since nearly all of my friends and family HATE mash potatoes, and I'm sure I haven't had mash potatoes myself for 15 years or so. Well I'm not one to shy away from a Daring Cooks' challenge! I wanted this dish to stimulate all the five scientifically recognised taste receptors (sweet, sour, salty, bitter, umami) of the palate, also I always think that it is important to add three other intuitive taste sensations (we don't have taste receptors for these but they are important to appreciate food's taste) that I call freshness, spicy heat and coolness into dishes. I thought for a while and decided to picture what I wanted my papas to taste like and what textures I wanted the various layer to have. Then after that it was onto the matter of deciding on ingredients and the relative ratios between these ingredients. also I wanted to balance these eight taste sensations so they would oscillate between each other with each bite of the papa. Of course there was going to be a contrast between the crispy crust and the soft mash and filling I decided equal weights of mash and filling would be a great ratio since the surface area of the papa would be big enough to contrast with the soft interior. I steamed the potatoes in their skins I always think that steaming (or roasting) produces the best mashed potato since the mash is much drier – in this case the mashed potato didn't really need the egg to stick it together I added cream cheese (for coolness) to get the correct consistency and to mellow out the heat of the spices so the flavour of spices (and not the heat) would be emphasised. I added mushroom powder (for umami) and harissa powder (for spicy heat) to the mash. I cooked the sausage meat (for umami) until browned and added the other filling ingredients; mushroom powder and seaweed paste (for umami), prunes and orange marmalade (for sweet), rice vinegar (for sour), preserved lemon and olives (for salty), spices (for heat), bitter cocoa chocolate (for bitter) and perilla leaves (for freshness). I decided to double the amount of filling as compared to the original challenge recipe since it didn't look like enough for the amount of mash. 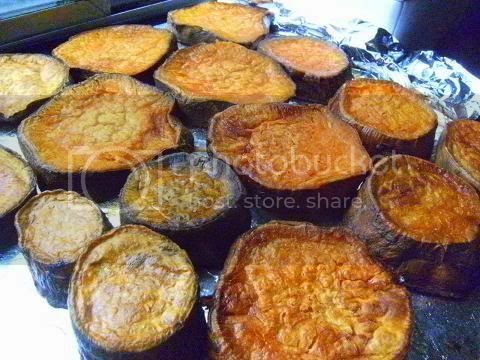 I used 100 grams (3½ oz) of mashed potato and 110 grams (a little over 3½ oz) of filling for each papa I got 9 papas (each 210 grams/a little under 7½ oz) from the recipe that is 1.9 kg (67 oz or 4¼ lbs) all up. I only had about 1 tablespoon of filling left which tasted delicious I thought. I doubled crumbed the papas and refrigerated them for 30 minutes which helps firm up the crumbing layer. I used rice bran oil to deep fry the papas I dislike canola (rapeseed) oil for me it has a strange fishy smell to it when used for deep frying. Each papa took about 1 min to brown. 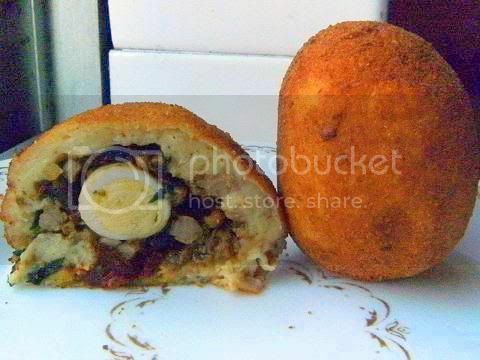 These papas are marvellous they have a wondrously thin crisp crust on top of a spicy soft mashed potato layer which encloses a delicious seven taste sensation filling which hides a whole quail egg. The papas are so filling two are enough for dinner, the taste and texture counterpoints are stunning, the filling is a gustatory delight each bite scintillates with different contrasting taste sensations WOW is the only word I can use, I was so pleased with the balance of the sensations, the sweet prunes and marmalade against the olives and preserved lemon is arresting while the soft mash and the crisp crust is a treat. I really like how the different tastes oscillated in my mouth. Even my friends LOVED them that is saying a lot. Thank you so much Kathlyn for such a great challenge. 1. Steam or roast the potatoes in their skins this will give a drier mash which will make forming the papa much easier. 2. I used a fork to mash the potatoes it worked out fine. 3. 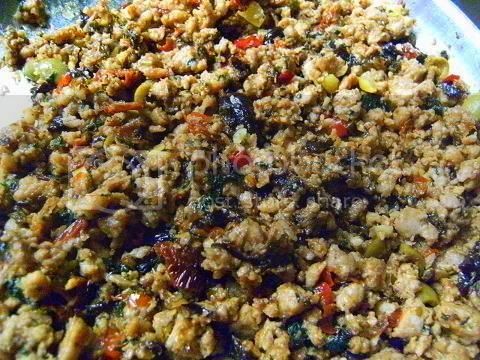 When you are browning the mince (ground) meat remember to break up the meat pieces during the cooking process. 4. I used some of steaming water to deglaze the pan since I didn't have any white wine in the house. 5. 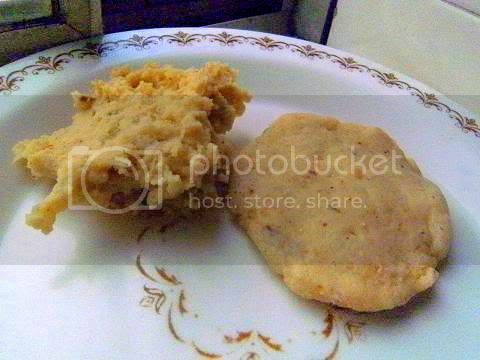 The mashed potato formed the pattie very easily without eggs or flour - I found that having dry hands worked best. 6. 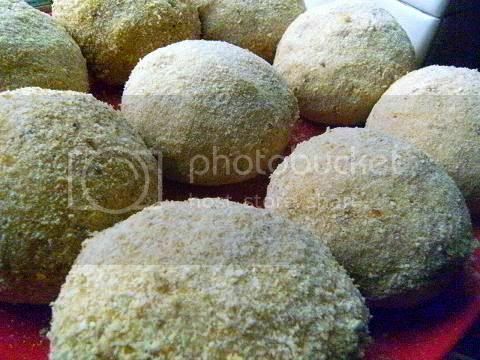 Double coating the papas gives the best results for deep frying, that is crumb the papas (egg, flour and crumbs) once then dip in egg wash again and coat in bread crumbs again. See below for more detailed instructions. 7. Refrigerate your papas this will help keep the crumbing on the papas and will firm up the mash also. 8. Don't use the filling while it is hot wait for it to cool at least to room temperature. 9. Using a wire rack to drain the papas is better than using paper towels the crust will be crisper paper towels trap moisture and makes the crumbing go soft. Place the paper towel under the wire rack to catch any dripping oil saves clean up later. 10. The deep frying forms a 'hard' thin crisp crust that holds the shape of the papa really well. The final papa cuts cleanly with a nice snapping noise. I was surprised how much the papas look like a potatoes LOL LOL. 11. I tried shallow frying the papa they were only average the mash 'melts' and the papa loses its shape and flattens a bit though it tastes about the same. I think this was due to the fact that I didn't use egg or flour to bind the mashed potato other cooks' had success shallow frying the papas. 12. I baked the papas this wasn't that successful it tasted fine but it flattens and didn't crisp up much so you lose the contrast between the crust and the mash. Again I think this was because I didn't use any binders (egg and/or flour) in my mashed potato I noticed some cooks had success baking the papas. 13. Making them ahead of time The deep-fried papas keep crisp and hold their shape in a warm oven for a long time this is the easiest method if you want to serve these delicious treats at a dinner party. .
Cooked papas – I love how the cooked papas look like potatoes, notice how the double crumbing produces a perfect thin 'hard' crust on the papas this helps hold the shape of the papas so it can be cut cleanly. The method I use for double crumbing an item is as following. 1. The item you are crumbing should be at room temperature (or cooler). If hot the crumbing layer may slip off because the egg wash might cook and form scramble eggs which means the bread crumbs will not adhere to it. 2. 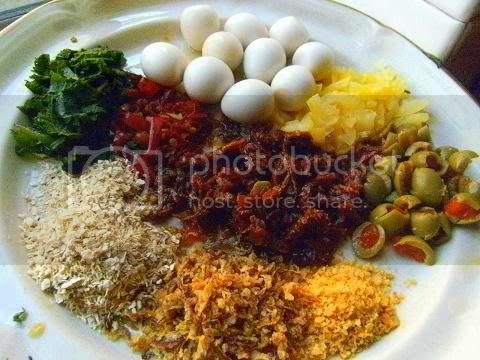 Prepare three bowls one for the egg wash, one for the seasoned flour and one for the bread crumbs. Don't place all of the bread crumbs in the bowl reserve some since the crumbs in the bowl will became wet from the process. 3. The egg is lightly beaten with a small amount of milk or cream. 4. 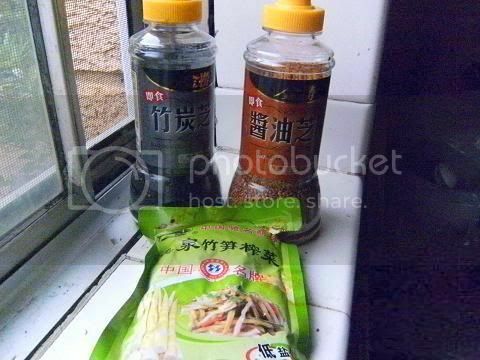 Make sure the flour is seasoned with salt and pepper etc. 5. The bread crumbs can be fresh (made from day old bread processed for a few seconds) or packet crumbs (Japanese panko gives a very crisp 'roughish' crust) while fine packet crumbs will give a very smooth even finish to the deep-fried item. 6. Start by lightly dredging the item in the seasoned flour, if the item is large I use my hands to lightly coat the item and then I set it aside, proceed to flour all the items. Doing all the flouring at once makes the other stages of the crumbing process less messy. Don't throw all the items into the flour all at once you will get lumps on the item. 7. Using a pastry brush paint a thin even layer of egg wash on the floured item doing this saves a lot of egg wash and produces a very even layer for the crust of bread crumbs. 8. Using your right hand only (if right handed) pick up the floured and egg washed item and lightly coat it in bread crumbs using the other hand do this over the bread crumb bowl some of the crumbs will fall into the bowl and will eventually make the unused crumbs wet. Don't place the item into the crumb mixture pick up the crumbs and spread it onto the item. Using separate hands to do the process stops your hands from becoming crumbed themselves. Set the crumbed item aside. 9. Crumb all the items refreshing the bread crumbs in the bowl when they become wet. 10. When all the items have been crumbed then egg wash them again and crumb again as above. 11. Refrigerate the crumbed item for at least 30 mins then helps the crumbing to set so it will deep fry crisp and 'hard'. Since I was born in Finland I grew up with raw fish so this recipe was something I was looking forward to make. My family makes this a lot this is my recipe I do for them. 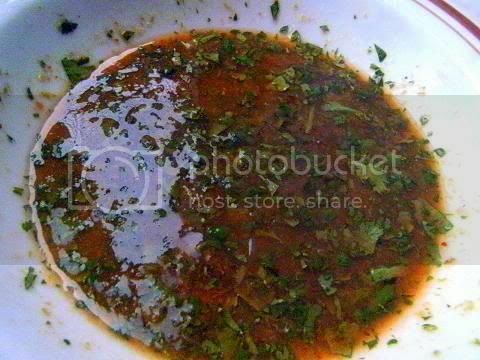 The trick is only add a hint of zing to the 'cooking' liquid you still want to taste the seafood not only the spices. I got a mixture of seafood for the cheviche (barramundi, squid, prawns, hoki, crab stick and oysters). For the 'cooking liquid' I used two types of citrus juice lime and orange (ratio 5:1) since I think some sweetness balances the sour lime juice. I like some zing in my cheviche so I added coriander, harissa paste, seaweed paste, Moroccan spice paste, sesame seeds (black and red), pickled lotus root (I love the crispiness of this against the seafood) and minced garlic. 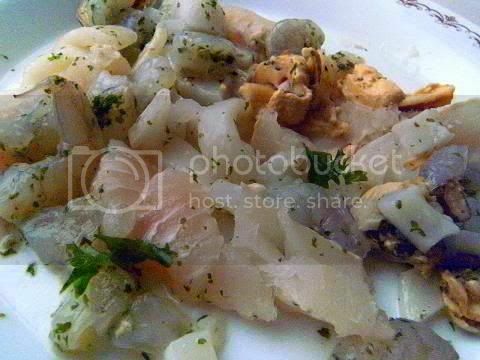 I then marinated the seafood for 10 minutes which is more than enough time to cook the various fish, crustacea and molluscs. This is a wonderful recipe simple and fast. I was so enthralled with the papa recipe I had to make some more this time I wanted to concentrate on the mouth feel and the after taste of the papa experience. Mouth feel and after taste are very hard cooking properties to control so I needed a lot of taste testing to get it right. This time I roasted sweet potatoes for 30 minutes at 350°F/180°C until the pieces were golden brown, 2 kgs (4½ lbs) of sliced raw sweet potatoes yielded only 1 kg (2¼ lbs) of roasted sweet potato mash an amazing reduction of moisture of 50% I added some mint and sea salt to the mash I didn't need to add any liquid to the mash to form patties for the filling, the mash already had a great mouth feel of soft sweetness. I now needed to go for saltly after taste to balance it. I fried up some hot spicy chorizo sausage (flavoured with paprika, cider vinegar, Tequila, red chilli, cinnamon and cumin) meat with about eight white anchovies (a large amount), garlic and onion when cooled I added some chopped coriander, cream cheese and chopped eggs. 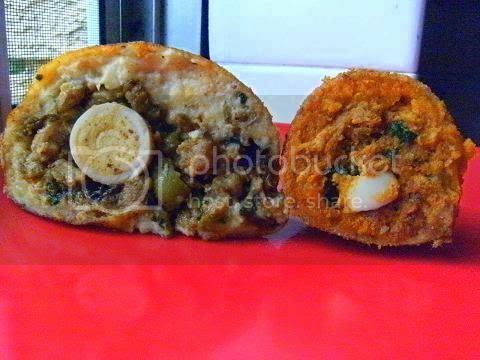 The filling really had a great hot spicy heat with a great salty and creamy mouth feel. I had to add the anchovies to the filling because the roasted sweet potato mash was very very SWEET tasting so the final papa needed the salty umami anchovies to balance the sweetness. I made the papas much smaller than the previous version I made, I used 50 grams (1¾ oz) of mash and 115 grams (4 ozs) of filling, this I felt was the best ratio so the final papas had the correct balance of tastes and textures. This was a good decision those papas were very rich with an incredible creamy mouth feel and a wondrously long after taste of sweet potato and mint. 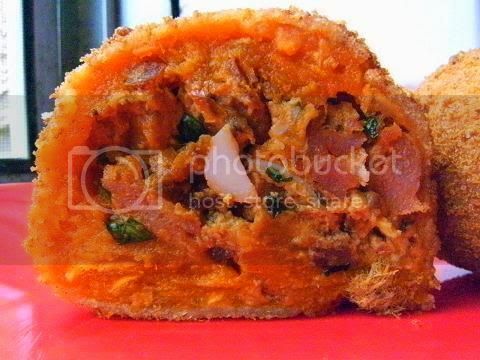 I just love the colour and flavour of the interior of the sweet potato papa it is gorgeous, the sweet mash and the creamy salty umami spicy filling was enticing I really liked the after taste of sweetness of the mash in this papa. These would really go well with tempura'd olives I think. Comparison of the two versions of papas I have made so far. I stored one crumbed (uncooked) papa (the first version) in the refrigerator I deep-fried it up with the second version papas it cooked beautiful with really no difference that I could tell from the ones I made early. I made an enormous amount of roasted vegetables last night. I made potatoes, carrots, beetroot , swedes and turnip. So I thought I would make a variety of papas. Steamed beetroot greens, beetroot mash with cumin/paprika, carrot mash with ginger, potato mash with garlic – I adored the look, colour and flavour of this papa. Olive mortadella, carrot/cumin mash and swede/garlic mash. The olive mortadella was a nice salty touch in the centre of the flavoursome mashes on the outside. 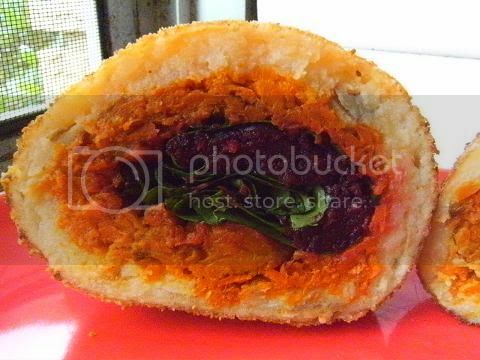 The big papa – reddish layer is beetroot/turnip mash with bacon, the white layer swede/potato mash. 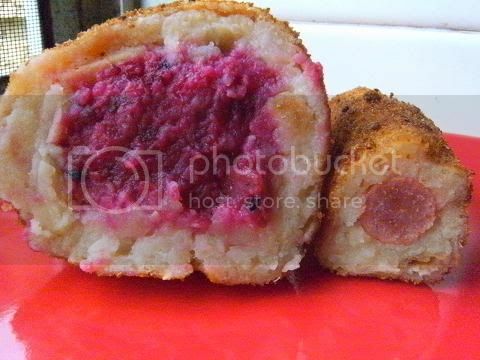 The small papa – spicy twig stick sausage with a layer of swede/turnip mash with garlic. I had friends over and we were talking about ceviche and I told them about the tofu ceviche I saw on this thread and said it would be great. 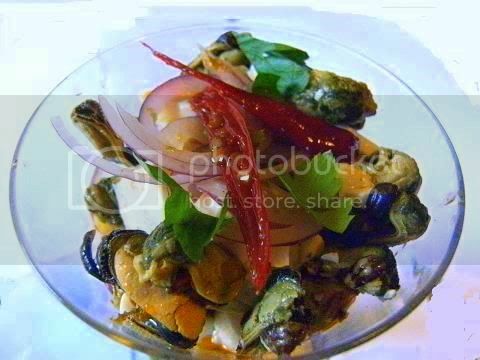 Now I have to say most of my friends don't like tofu much so we decided to make a ceviche using silken tofu, mussels and salsa criolla to see what it was like. All my friends helped with the preparation we had it completed in 12 minutes while sipping wine. WOW this was exquisite it was light, tasty and highly flavoured, I cannot believe how well silken tofu goes with mussels the textures of both work so beautifully together the mussels add seafood flavour/chewiness while the tofu adds creaminess with the criolla ceviche adding crispness and freshness overall it tasted like a light tasty seafood dish, the mussels really added that overall seafood taste to the whole dish. I was so impressed with this dish I will doing it again tonight for a party. Even the tofu haters and 'indifferents' loved it average score (from a group of six) was 9/10. I absolutely loved the look of it and its taste and mouth feel. I was a little skeptical of criolla salsa since it has so few ingredients but it astounding how good it is and it should go well with a lot of other foods I'm sure. How you have the time, energy and imagination to make so many amazing variations just blows my mind! I love to see the things you come up with each month! These papas all look so great! I really appreciate the helpful tips, as well as the creativity which you inspire in all of us! Great job! Amazing as always Audax. My post is not even up yet... timedifference! :) I've finally managed to make a challenge again and I loved it. I haven't done the papas yet though but I will as I already love their versatility! 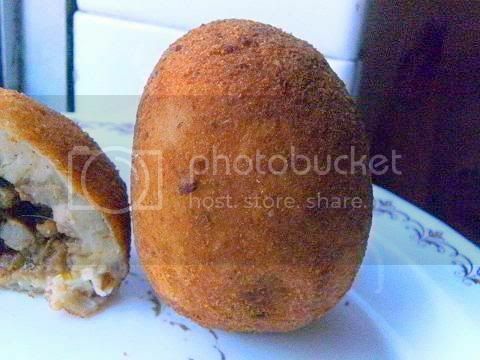 Papas looks like filled potato cutlets. other recipes looks awesome, lot of flavors going on there. What an amazing combination of flavors and colors! I think I'd go first for the chorizos- then for the beet/beet greens... but then, they all look wonderful. Great job on this! Always so beautiful - I still haven't tried the sweet potato version, but I am so looking forward to it! Thanks for all the research as always and the extra tips that made the challenge so much better for all of us!! Love your interpretations of both challenges! Your "eight-sensation" papas rellenas are like the ultimate scotch egg - such a great idea :) And love the flavors you chose for the ceviche, very unique! As always, Audax, you have done such an amazing job. I always wonder how you come up with so many different variations! I loved the idea of the quail egg and "borrowed" it to my humble Papas. Thanks for all your encouragement throughout the month. I'm sure you were the inspiration for all of us!! Once again, add me to the list of the inspired. Your dishes are beautiful to look at and I'm sure they were even better to taste! Wow. Wow, I would love to spend a day amongst your thoughts. Amazing creativity! Your food looks amazing! You are so committed, Audax. My favourite one here is the sweet potato and chorizo - I think that will be the one I try next time. Your 8 flavor papas sound great (love the addition of the bitter flavor with the cocoa) and the chorizo and sweet potato version is making my mouth water! 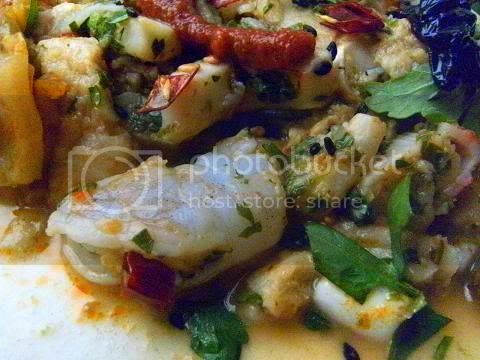 The mixed seafood ceviche sounds perfect, as it has all the flavors that I'm dying to try when I get a chance to make this myself! Again, very impressive! Your enthusiasm and originality shines for each challenge. Excellent job on this challenge! I love your papas. They look perfect. When are you going to write your own cookbook? You are so talented in the kitchen and with words - you could give Alton Brown a run for his money!! 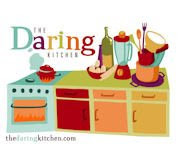 Thank you for your contribution to The Daring Kitchen - you are truly an inspiration to me and many, many others!! Great job on this month's challenge! Wow, amazing varieties of papas filling. 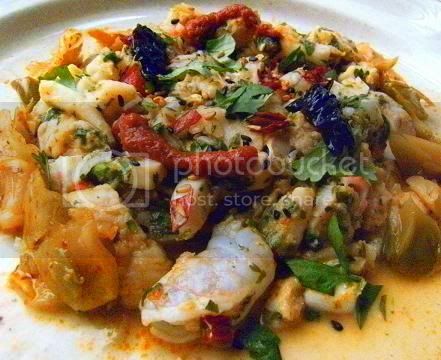 But I'm taken with the mixed seafood ceviche, it looks delicious! 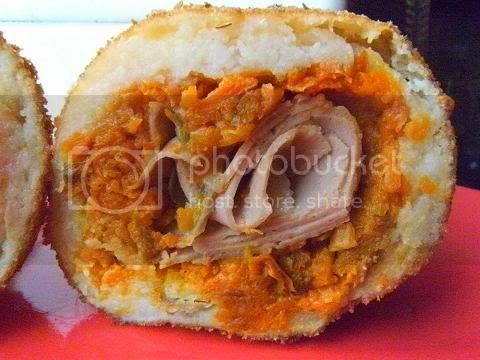 your papas rellenas are a real masterpiece! And your pics step by step! Really nice work! I love your papas! So many variations and they all look amazing! Great job! 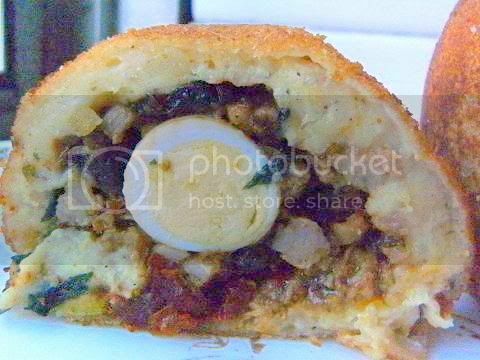 Wow - the quail egg papas looks so good - I wish I wasn't the only in the house who likes boiled eggs. Nice presentation also in the cocktail glass. Excellent job once again! I am groovin' on the look of the Cornucopia Papas, I can only imagine that they tasted great. 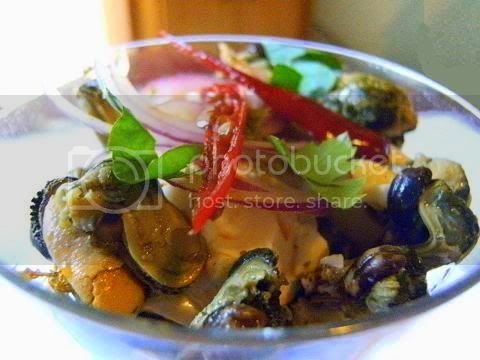 I now have to make a ceviche with mussels, yours is making my mouth water. Love the variety. Wow, that was amazing. I am so impressed. It is very inspiring. Thanks for visiting my blog! Once again you cooked enough for a well fed army. Some really great combinations this month. I think the chorizo/sweet potato papas and the mussel ceviche sound best to my palate. I might add avacado instead of tofu but that is just me. Wow, you tried it all and then went above and beyond with such delightful twists! I want to be a Daring Cook like you when I grow up! Wow, so many options! Great job - such creativity! Gorgeous flavour and amazing job you have done. Love your post, Audax. I like the one with quail egg! Well done! 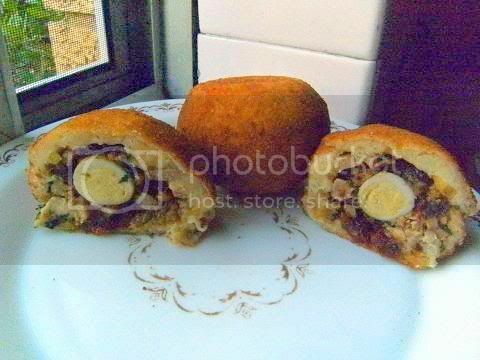 Adoro la papa rellena y el cebiche! son dos de mis platos preferidos. Veo que tienes muy buena mano en la cocina, yo me dedico mas a la elaboración de pasteles decorados. I was thinking wow looking at the eight taste sensation version and then I spotted the sweet potato & chorizo sausage papas. Brilliant twist on things, as usual. What great dishes! 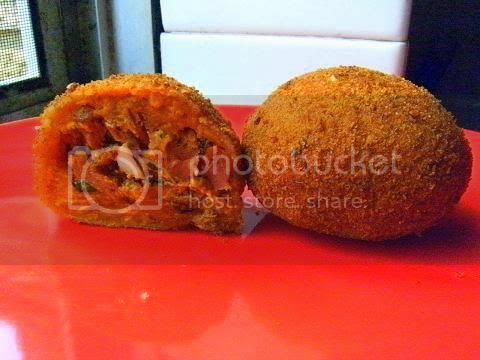 Those papas rellenas look terrific and so appetizing. The cerviche looks gorgeous too. Perfect. I love your posts, they are always so inspiring! I can't even start to imagine where you get all the ideas :) Thanks for visiting my blog. Cheers from Spain! You know,I've made ceviche many times at restaurants and a few times at home, but I always used the same basic recipe (lime/lemon juice, herbs, red onion, s&p, and maybe a couple more seasonings). Harissa paste? 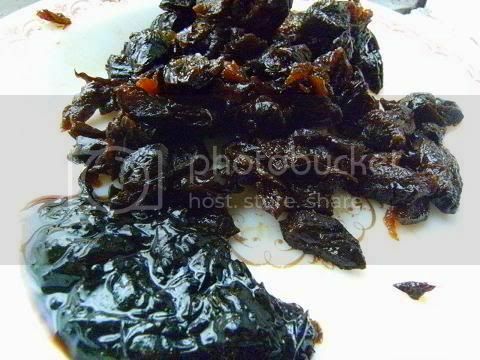 Seaweed paste? Moroccan spices? This is right up my alley. When I saw your recipe, I wanted to re-do mine. Man! It looks delicious. Oh, Audax, as always I am blown away by the research and careful thought you give to these challenges. You always create such wonders! Holy Moly, my mouth is watering over every single one of your takes on the papas, and your ceviche is just gorgeous. I forgot about the challenge this month :( UGH.